Good Joke? Australian Leader Says End Of World Is Coming : The Two-Way Prime Minister Julia Gillard helped a radio show plug its "end of the world" special by solemnly saying that the Mayans were right. Oh, those wacky Aussies. See the video. Wednesday, it was two disc jockeys impersonating Queen Elizabeth II and Prince Charles to trick a nurse into telling them how the Duchess of Cambridge was coping with her morning sickness. 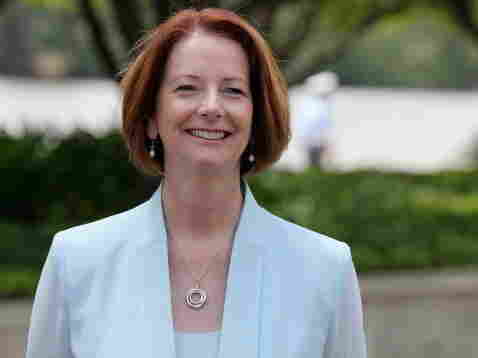 Now, there's word that Prime Minister Julia Gillard has done a promotional video for another Aussie radio show in which she solemnly says the Mayans were right about Dec. 21 and that, "my dear remaining fellow Australians, the end of the world is coming." She says the causes are likely to be "flesh eating zombies, demonic hell beasts or from the total triumph of K-Pop." The Australian reports that "when contacted, the prime minister's office said: 'What Australian doesn't mind a laugh from time to time? Anyway, the world's going to end tomorrow so shouldn't you be writing about that?' "